I’d love to know how many of the UK’s regional newspapers have run liveblogs this year; it seems as though real-time coverage and participation in almost everything (public spectacles, event TV, sports, political rallies to name a few) is on the increase when it was hardly in evidence 12 months ago. I’ve been pondering this as the Newspaper Society is planning an article on the Post & Echo’s liveblogs, and contacted me for some information, plus I also received an email from CoverItLive’s Keith McSuprren with links to two liveblogs of the Emmys. The New York Times liveblogged the event on its TV Decoder blog. It reminded me of the Guardian’s entertaining television liveblogs and has great knock-about comments from readers/viewers who are interacting with the host and each other. Canada’s National Post used CIL to liveblog and the contrast is quite apparent. It engages the post-event reader just as much as those participating at the time – it’s compelling, entertaining and, possibly a more attractive commercial option for sponsors as well. The posted comments show how invested the online audience was in the Times’ offering but it just doesn’t have the same longevity, or presence, as the Post’s. The Post & Echo run liveblogs fairly regularly; the last one saw me part-hosting the whiteknuckle ride that was the Everton FC v Standard Leige UEFA cup match. I was only doing a 30 minute stint but it was incredibly intensive. The footie liveblogs are great for fans without access to radios or TV (some are overseas, some trapped at work on a night shift) and their demand for information is relentless – believe me, if you think ringing in copy on deadline to a news editor is intense, try finding the team sheets for a UEFA cup match with a clamouring audience. Before you start, ensure you’ve banked information your readers are likely need so you can upload it with minimal delay. 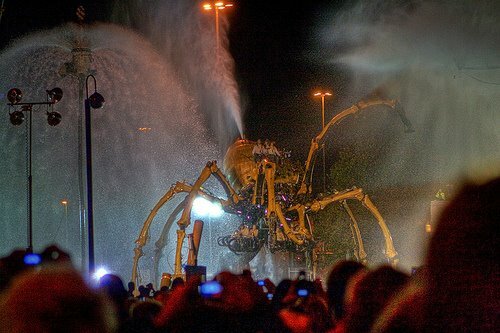 For the Tall Ships that meant knowing links to any webcams and shuttlebus times in advance; for La Machine, a timetable of the giant Spider’s performances. Being able to respond very quickly to queries on these issues (which tend to come right at the beginning) sends a message to your audience that your blog is the source of information they need. You’ll get constant queries for this information and can just refer them to the top of the blog. Newcomers don’t necessarily know what a liveblog is, they may have just Googled some keywords in an attempt to find information and wound up on the blog. So a welcome and introduction which states exactly what’s going on then users’ expectation levels are set. For example, football fans won’t expect kick-by-kick coverage but will understand it offers broad reporting, colour, photos and fan banter. Share what you’re doing with the liveblog. As in ‘Our photographer is downloading the images now – they should be up here in the next 5 minutes’ or ‘we’re planning to live-stream this event starting at xpm’… it lets users know there’s a structure in place for the coverage and makes the liveblog feel more as-it-happens. You can also plug upcoming related content in the newspaper, let people know how they can get involved or point them towards photosales. I feel an obligation to blog readers when I’m either filing for a liveblog or helping produce one. After all, we’ve offered them a service, they’ve bothered to come and use it, so we have to listen to their opinions, criticisms and observations. There’s no point ignoring critical comments or refusing to upload them; accept not everyone will like what your doing and let those that do respond. I think every liveblog I’ve been involved with has attracted at least one comment along the lines of how useless newspapers are now compared to what they were, and how we should be doing real journalism. Don’t post defensive replies – it looks petty, and blog readers are just as likely to shout down the naysayer for you. And don’t promote comments that contain language you’d refuse to accept in the printed paper. They really do and if you fail to deliver they may well get annoyed; the clamour for images on a liveblog of an event is daunting at times. During the La Machine liveblog our Flickr group photos were an invaluable resource – as was the special text line for spectators to send their cameraphone pix. YouTube is great – a recent search for Steven Gerrard produced a host of (very professional!) ’10 greatest Gerrard goals’ type video packages, which the BBC and SKY may not be too happy about but hey… liveblog readers waiting for kick-off would love to have a link to them. Livestreaming is a great option; readers aren’t too fussed about the quality – they just want to experience something as it happens. So those are some of the things I’ve learned while liveblogging. Personally I love doing them – you really feel a part of the event you’re covering, you’re providing a service that people enjoy, appreciate and get involved with, and it means you get to break news. It’s also a great way to change minds in the newsroom about the value of interaction – when you ask something and a response is straight away, it brings home the fact that newspapers have an audience with answers as well as questions.